Dimensions: 14"H x 8.5"W x 5.5"
Got this unit about a week ago, never used a media reactor before. I'm using 10 tablespoons of gfo for my 40 gallon reef and there is still plenty of room left to add some carbon, which I will do soon. It was super easy to set up. I'm not sure what happened to the people complaining about the flemsy mount bracket, missing connections and rigid hoses. The bracket feels very solid, it's not going anywhere. All the proper fittings and connections were included to hook up to the pump. The hoses are pretty rigid but they're easy to cut with scissors and place in the sump where you need them. Make sure you use the big wrench thing to tighten the canister down all the way. I thought I had cranked down on mine but it still wasn't tight enough and water leaked out. It takes some good force to get it tight all the way. I found myself with yellowish water for years and could never completely get it so I decided to try this reactor with carbon. It was way simple to setup and I saw a huge difference within 24 hours. Now my water is so clear. Love it. Works like to suppose to if you know what you're doing. Use the recommended pump and adjust it from close to open you'll have to comeback later and tweak it some more at some point after that as long as your pump can handle the back pressure it should work fine. I'm using GFO. Have been using this for a few months now and like it so much more than the 2 Little Fish version. I always had trouble getting the top off that model. But, not so with this one. It's much easier to clean and is built more sturdy. I would recommend this product. My wife bought the double a few years ago from BRS and it works perfect so I thought I would buy the single and use it as a media tumbler in my 60 gallon nano. It also works perfectly. The mounting bracket is super flimsy. Added this along side my BRS Dual Carbon and GFO as a Bio reactor. The single Reactor bracket is not as deep dimension as the Dual reactor bracket. So even side by side the canisters do not line up. I may opt for a metal bracket on this unit in the future. Easy to assemble. Works well with carbon or gfo. Can control the flow with valve. ALways had difficulty changing the contents of the "2 Little....." brand. Not so with this one! Cleaning and changing granules is much easier! I haven't had any trouble with it, running carbon and gfo in it since Christmas. My sister in law got me the hook up on this. You so have to make 100 percent sure the carbon and gfo are mixed well, buy that's not the reactor. Imo the system works great. Its a good concept, but it does clog pretty quickly. For the first week or so you have to monitor the water flow and clean if necessary. 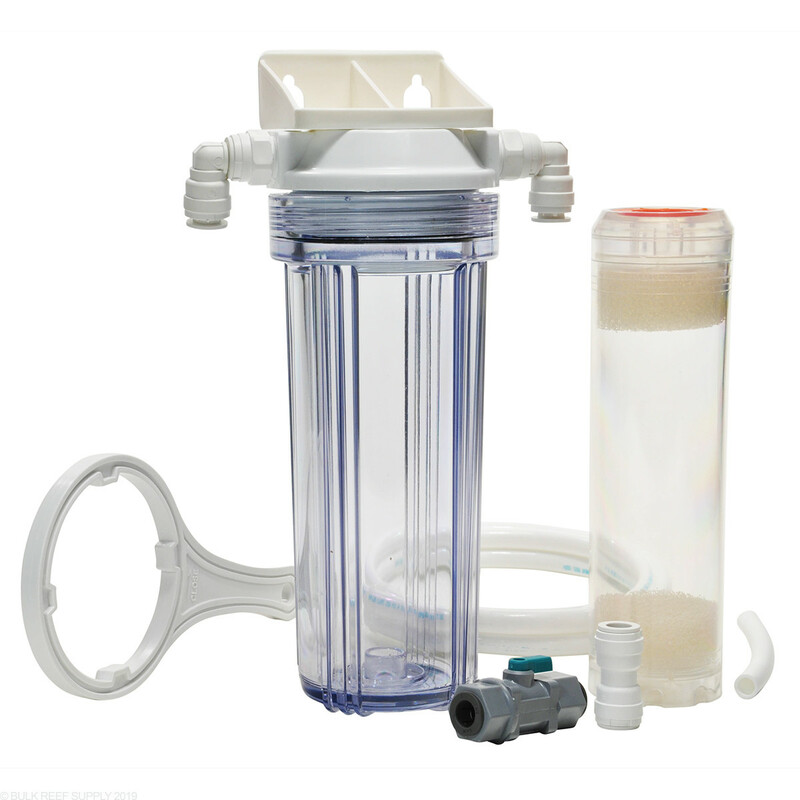 Does the MJ1200 come with some kind of per filter so I'm not sucking up gunk in my pump? Can this be run inline with the biopellet reactor? What kind of flow rates would be required? I will be purchasing 3 reactors from you. Can I use 1 Cobalt MJ1200 with two separate reactors? I don't have room for 3. While we have found the MJ1200 to work well for running a pair of reactor canisters in series, this does put additional resistance on the pump and for larger media loads this can lead to issues if you are planning to tumble media. I would not recommend this pump if you are planning to split the flow and run the reactors off of a tee. In that case, something more powerful like a Sicce 2.0 would probably be a better fit. How could I incorporate purigen into this with carbon and gfo? Or would you not do this? Thanks for your reply! You certainly can run it in a reactor without issue. Reactors are able to pass more water over the concentrated media and will inherently have better performance. Feel free to let us know if you have any further questions! My question is this: why not run carbon between pads with gfo under it where it can tumble? Or what about gfo and carbon together with purigen tumbling beneath? Thoughts? the main reason is flow for the tumble. when multiple media are used it certainly will take up room in the chamber, in most cases there is not enough room for a tumble when the canister is taken up with carbon. While this could work on smaller systems 30 gallons and under, larger tanks would need more media and inherently more room to tumble. Feel free to let us know if you have any further questions! The gfo is tumbling on the surface, but the gfo on the bottom of the pile does not appear to be moving. Is this a problem? Not a huge problem unless you find the water is not flowing out of the reactor. This can be mixed up and adjusted flow to attempt to correct the flow in the bottom of the GFO. Feel free to let us know if you have any further questions. I see you rate this for a 50 gallon tank when using a mix. Is that due to the media capacity? If so, would it be ok to use on a 200 gallon as long as I change the media more often? this is due to media capacity and flow through the media. While you can change out media more often for best performance and cost efficiency a larger reactor is recommended or a dual to separate the GFO and Carbon. Feel free to let us know if you have any further questions! If I increase the flow, can I run this unit stand alone in the cabinet under my all in one aquarium (no sump). The drop and the return would each be about 4 feet. Can this unit withstand the pressure from this flow and maintain an adequate tumble? Should the unit not be used in this fashion? (I note my intention is to add LEDs and use the unit as a Cheeto reactor). Hi Brian, thanks for reaching out. Provided you choose a pump with sufficient flow you shouldn't have any problems mounting this unit as described. 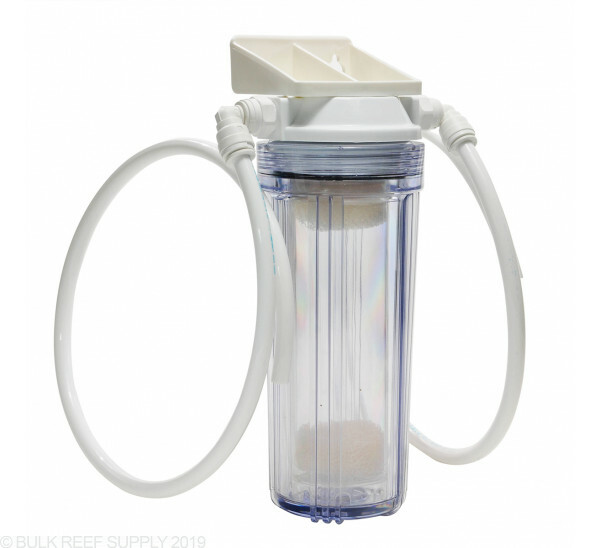 The canisters are rated to pressures far exceeding the capabilities of any aquarium pump. My only concern would be water spillage when opening the canister. I would recommend installing 2 valves as close to the reactor as possible while leaving some space between the elbows to allow you to remove them if need be. Placing a tray or other container under the unit would help reduce the impact or any spills. The max capacity for the reactor would be a total of 3 cups of media if it doesn't need to tumble (like carbon/gfo mix). If you were actually maxing out the reactor though you might want to consider a larger pump then the standard mj1200. I am wanting to get a y fitting for this and wondering what size i need.... i am going to run another line to something else. I have 300' of 3/8 tubing at the house and would like to use it!!! All of our reactors use 1/2" tubing and fittings, hopefully you have some of that laying around too! I am running a 150 gal tank. How many of this reactors do I need for my tank? You will want one rector for Carbon and one for GFO on a 150 gallon tank. Feel free to let us know if you have any further questions! Hey, I'm trying to learn all I can to keep a good reef tank. Would this be a good choice for a 55 gal? I wanted to start with a smaller aquarium until I can get the hang of everything. The reactor is a great way to tumble GFO or run carbon (or both together) to keep colors and odors under control and Phosphate levels to a minimum (with GFO). This unit is designed to be used in a sump in most cases and not hang on back. Feel free to let us know if you have any further questions! If I use a carbon reactor in my sump, will i need to continue using the carbon in filter bags in the sump basket? I assume the answer is no, but by removing the media bags, not all of the water of the water will be filtered through carbon before returning to the display. Also, do I place both the intake and output hoses of the reactor in the same sump chamber? Or should the outflow go directly into the last chamber with the main return pump? What is the recommended tank size for the single reactor? It has a capacity of 2 cups of GFO or 3 cups of carbon. How big of a tank that works for really depends on what specific media you plan to run. What type of GFO or carbon were you planning to use in the reactor? How many liters an hour will this do? This will depend on what pump is used. With the Cobal MJ 1200 pump you can expect flow at maximum 200 Gallons per Hour. Feel free to let us know if you have any further questions! What other pump would work with the reactor to run GFO? Thanks. 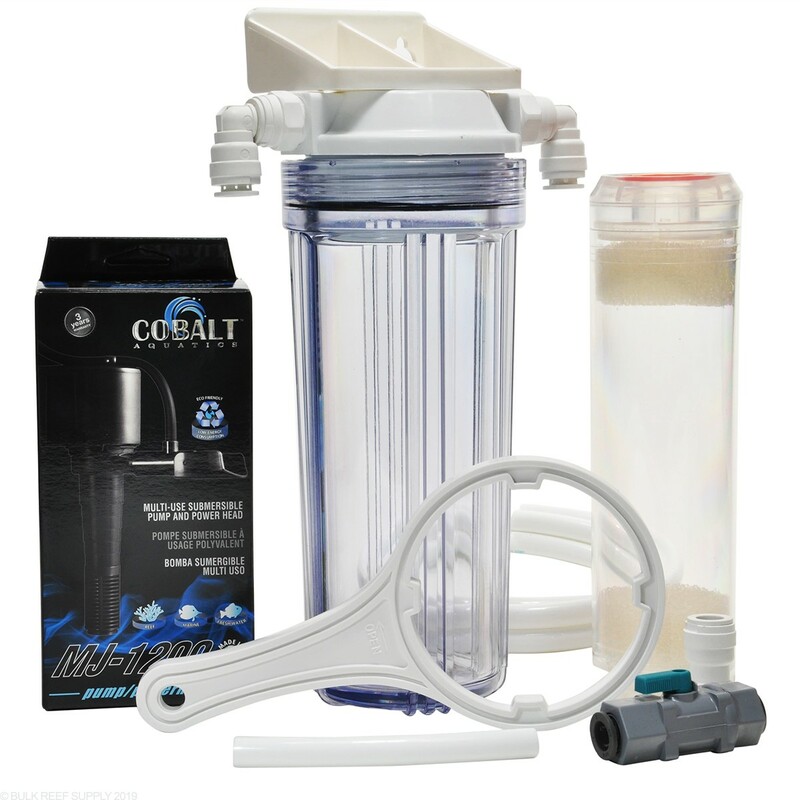 Really just about any pump in the 300gph range will do the trick, the Cobalt MJ1200 just happens to be any easy fit. The only pump I would avoid is the marineland maxijet 1200, as they are quiet loud when used for this purpose. I see the dual reactor setup runs off one pump (according to photo), would it be suitable to run 2 separate reactors off one mj1200 pump? It's been working great for a long time but the push-fit adapter broke off flush with the top and I can't get it out to replace it. Do you just sell the tops? I would like to run this and a dual reactor off of a Y valve coming from my return pump. My return line is 1" schedule 80 PVC. I would like it to split off right after the anti-siphon valve, with one side of the Y going toward my reactors, and the other side as a return to the tank. My reactors use the normal 1/2" flexible tubing supplied with the reactors. What adapters would I need to facilitate that connection? I know I will need a 1" PVC Y valve, but from there, I need something to knock down 1" PVC to a 1/2 flexible push connector. I can split that Y again for the 2 reactors. Help? You will want to use a Reducing Bushing 1” Spigot x 1/2” Female Thread and a 1⁄2" Male NPT x 1⁄2" Push Connect to adapt your reactor plumbing to your return line. I would avoid multiple Y fittings and make a manifold using a T off you main line running to another T for one reactor and then the end of the line going to your second reactor. I know its difficult to describe so take a look at this to get an idea of what I am going for. Each output will need a valve as will the line going to your tank. Getting the flow right to each reactor and your display tank can be a little tricky but you should only need to do it once. 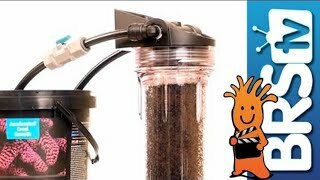 In the video series of how to start a saltwater tank they use some elbows not included to help hold the plumbing in the tank for us that don't have sumps. I was wondering what pieces they were exactly and where/what hardware store it was gotten from? I checked my local Lowes and had no luck finding similar parts. Hi Mike, If you are physically mixing the GFO and carbon together, then you only need to use a single sponge at the top of the mixture to help keep it in place. You can use one below the GFO and carbon mixture, but the built in strainer will usually keep particles from seeping through. 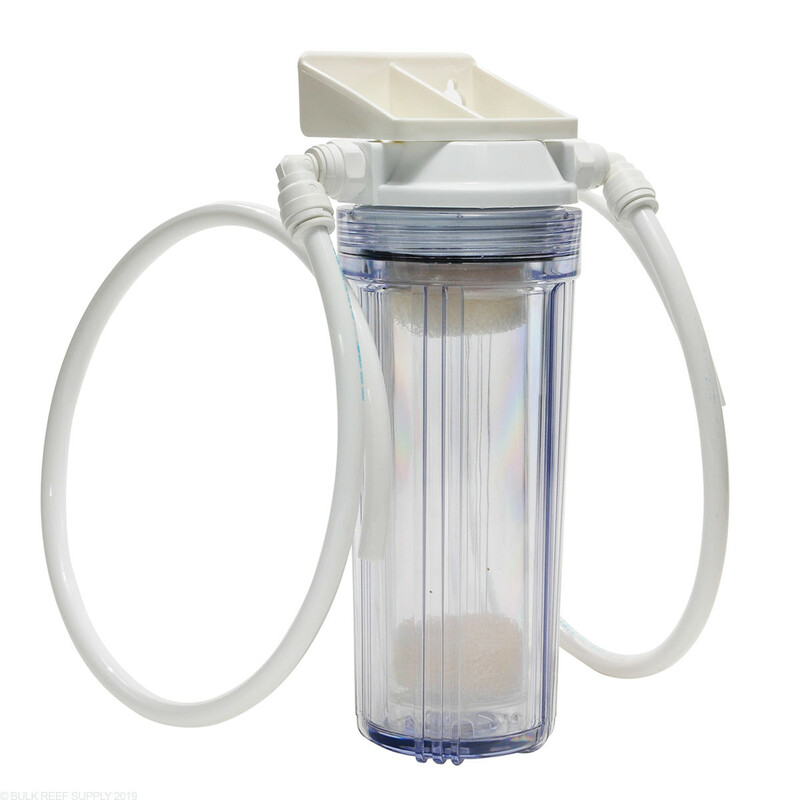 Water will flow from the bottom of the refillable cartridge up to the top which will push the mixture to the top. By using a foam pad to "hold" the GFO and carbon in place at the bottom of the cartridge will keep the media from moving or tumbling. What size tubing comes with the single reactor and can it be replaced with a more pliable tubing. I purchased one of these units and had trouble bending the tubing into the location I wanted, it is quite ridged and tough to bend. It is 1/2" RO tubing. More can be found at the link below. Honestly it wouldn't really be worth it to try and adapt to a different type of tubing as you would basically have to rebuild the whole filter. I would suggest just using a push connect elbow if you need to go around a corner, that way you also won't have any issues with kinking. If I were to use the recommended amount of GFO on a 125 would that be enough? Or would I need the dual one? How do I run both GFO & Carbon in the same reactor? (not mixed). Any sort of divider in the middle to be used? If you are going to use them both in the same reactor but not mixed, you would use a sponge pad as a divider. That said though, if you aren't going to mix them you may be better off with a dual reactor which will make it much easier to change the media. What is the largest width diameter of the plastic canister part? Our reactors clear plastic housing will measure just around 4.5” at its largest point. Do you sell the sponges separately? Mine are dirty and will clog very quickly even after a solid cleaning. We certainly do, the replacement pads for our reactors can be found here: https://www.bulkreefsupply.com/brs-reactor-replacement-pads-hard-shell.html. Can you run this if you don't have a sump? Its not a problem to mount the reactor behind the tank or something to that effect as well. It doesn't hang on back, but so long as you have somewhere to put it, its not problem at all to use it on a tank without a sump. That shouldn't be a problem at all. The reactor should have enough room to hold the amount of media you need to run with just about any type of GFO or carbon you use on a tank that size. Do you carry replacement sponge disks for the media cylinder for this reactor? 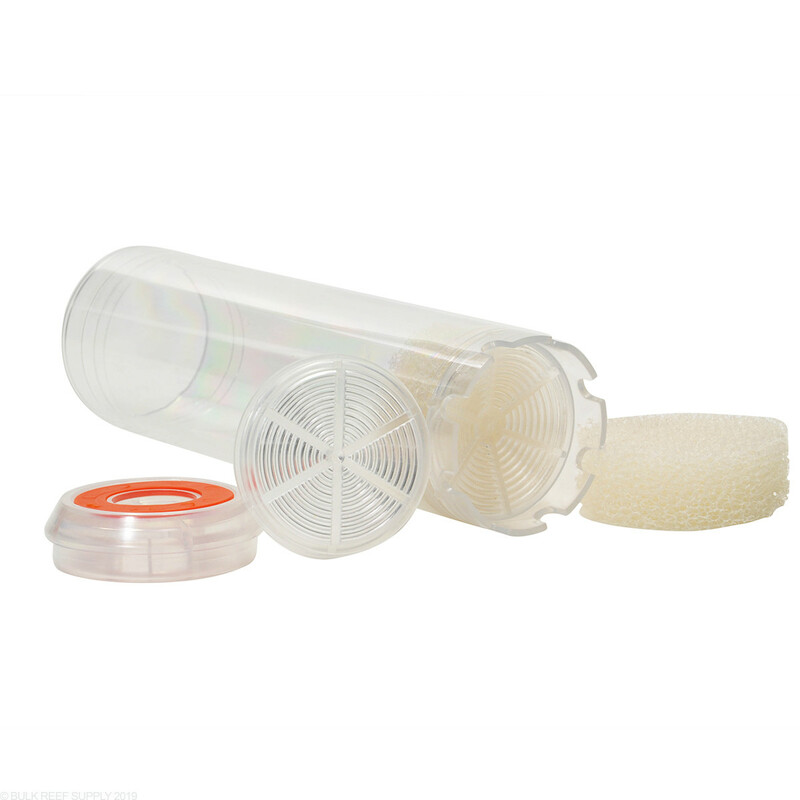 When changing the filter media in th BRS media reactor, what are the steps that need to be taken? I was conserned about getting water everywhere when unscrewing the lid of the reactor to change out media. Thank you BRS! Changing the media is actually really easy. You just want to make sure that the pump is off and then you unscrew the bottom canister. While you might spill a few drops if your careful almost all of the water will stay in the bottom canister and you can carry the canister media and water to the sink to drain it and replace the media. You can leave the main bracket mounted, the pump in the tank, etc. What is the difference between this one and the brs biopellet reactor? Can I use this one to run biopelletes? 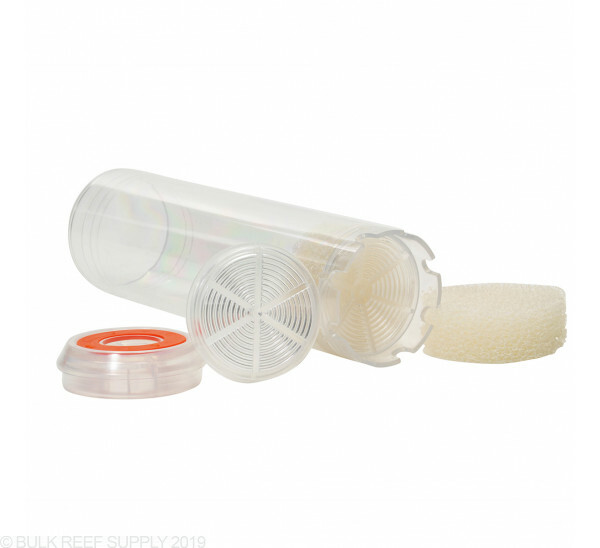 The biopellet reactor doesn't have sponges and comes with fittings to adapt to larger size pumps (which are generally necessary with biopellet reactors). This reactor will physically hold them but wouldn't come with the fittings for larger size pumps. Will this hang on the back of my DT? If not can you recommend a quality HOB model and pump? The BRS reactor does not hang on the back. Units that hang on the back aren't as common, the phosban reactor is the model most folks will use in that situation. 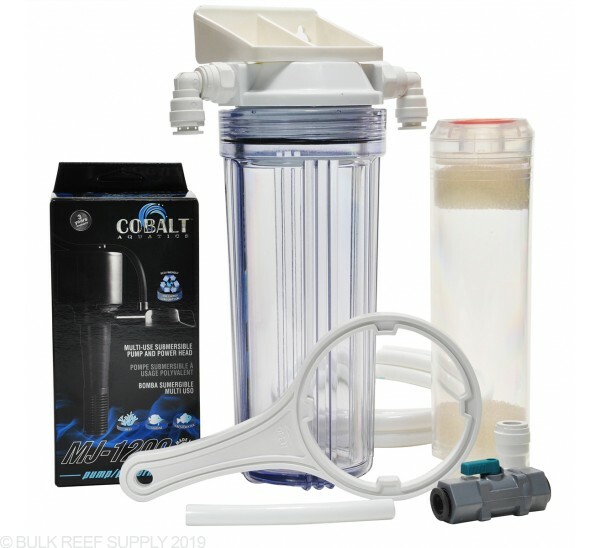 The same cobalt mj1200 is a great pump option for it as well. Is this the same as the one for use with bio pellets? Just with foam pads, or is the cartridge different? 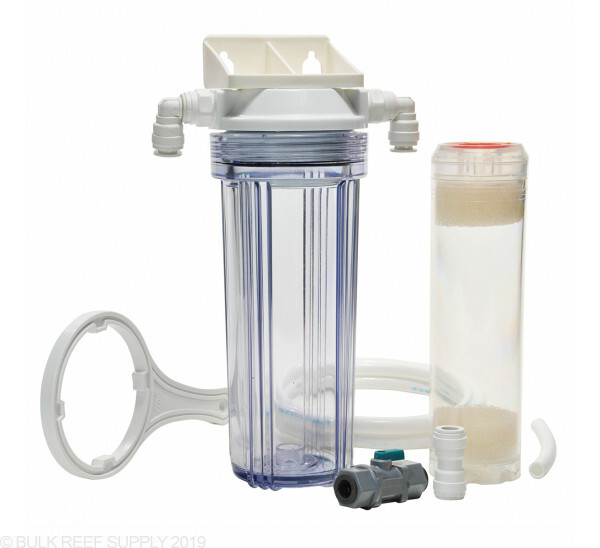 The biopellet reactor doesn't have foam pads and it also includes fittings for a larger pump (bigger pump is needed for biopellets) wheras the gfo/carbon reactor only comes with an adapter for the cobalt pumps. Do you sell replacement foam pieces to hold the media in place? Mine have lost their spring.